A comet plunged into the sun this week just as a huge eruption exploded from the star's surface, but the two events are likely not related, NASA scientists say. 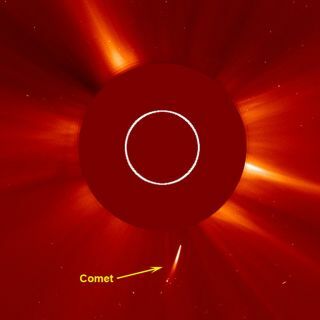 NASA's Solar and Heliospheric Observatory (SOHO) spotted the ill-fated comet diving toward the sun between Tuesday and Wednesday (May 10 and 11), never to be seen again. "Interestingly, a coronal mass ejection blasted out to the right just as the comet is approaching the sun," SOHO officials explained in a statement today (May 13). "Scientists, however, have yet to find a convincing physical connection between sun-grazing comets and coronal mass ejections." In fact, the coronal mass ejection (CME) actually erupted before the comet could possibly have had any effect, researchers said. And another NASA sun-watching spacecraft, the Solar Dynamics Observatory, has the proof. This image from the SOHO spacecraft shows a huge coronal mass ejection erupt from the sun's surface shortly before a comet dove towards the sun and disappeared. The solar explosion occurred before the comet was close enough to have any impact, NASA officials say. The comet was first discovered by amateur astronomer Sergey Shurpakov, SOHO officials added. It is classified as a sun-grazing comet because its path brought it close to the sun. Astronomers suspect the comet was part of the so-called Kreutz family of comets. Kreutz comets are comets in orbits that approach within a few hundred thousand miles of the sun. Coronal mass ejections shoot charged particles from the sun over several hours. Such solar eruptions can spew up to 10 billion tons of plasma and expand away from the sun at speeds topping 1 million mph, NASA officials have said in the past. The sun is in the midst of an active phase of its 11-year solar weather cycle. The current cycle is known as Solar Cycle 24. The SOHO program a joint mission by NASA and the European Space Agency.